Bluetooth is a wireless technology that allows computers, phones and other devices to talk to each other over short distances (up to 100 metres). Bluetooth uses radio waves (in the 2.4 Gigahertz range), and is designed to be a secure and inexpensive way of connecting and exchanging information between devices without wires. You'll find Bluetooth in many of the newer mobile phones, handheld computers, laptops, printers, handheld organisers, as well as in all sorts of products. Uses of Bluetooth include: sending photos from your mobile, exchanging business cards, sending voice from a headset to a mobile phone, and real-time satellite navigation using GPS. This page provides some basic information on what Bluetooth has to offer, plus links to Bluetooth products. Connect to your PC to transfer files and perform a backup. Connect to your PC or laptop to transfer files. This site has several pages on PDAs. We recommend devices powered by Windows Mobile. Hands-free calling from your mobile phone is possible with the aid of Bluetooth. OK, so you may end up looking like a Borg, but combining a Bluetooth mobile phone with a headset means you can use your phone without holding it to your ear, and without all those messy headphone wires. Most PCs and laptops don't have built-in support for Bluetooth, but for around £15, you can add Bluetooth via a special USB Bluetooth adapter. We recommend the Belkin USB Bluetooth adapter available for around £12 from Amazon UK . - This lets you create cable-free connections between your USB desktop PC and devices using Bluetooth. The Adapter is compatible with Bluetooth v1.2-certified devices and enables you to connect wirelessly to up to seven other devices such as printers, PDAs, and mobile phones. There's also a selection at Dabs.com. Connect your PDA, laptop or mobile phone via Bluetooth to a wire-free GPS receiver - these get a fix on your location from orbiting navigation satellites and overlays your position onto a map and/or route planner. For on real-time mapping and route planning using Bluetooth, see our GPS page. If you have a Pocket PC, Windows Mobile or a Smartphone, consider TomTom Navigator 7 as your PC navigation software solution. Allows users to connect to the Internet using Bluetooth. The D-Link DBT-900AP Bluetooth Access Point is designed to extend LAN network services to Bluetooth-enabled devices such as laptop computers and PDAs. This Access Point provides a new solution for wireless connection of multiple users and devices on a Bluetooth network. Alternatively, you can buy a Bluetooth print adapter that lets you use Bluetooth with your existing printer. 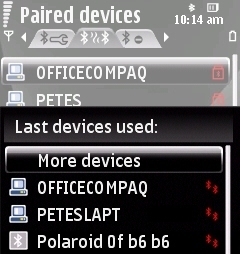 These enable wireless printing of data or photos from your Bluetooth-enabled desktop PC, laptop, PDA and mobile phone. You'll find a selection of Bluetooth print adapters at online stores such as Amazon and Dabs.com. Finally, consider a portable Bluetooth printer, such as the tiny ink-free Polaroid PoGo. No expensive ink cartridges, send pics from your phone's camera by Bluetooth for near instant pics from this handheld rechargeable printer. Many of the Bluetooth products mentioned above are available from UK supplier Dabs.com. Use a Bluetooth GPS device for satellite navigation on your mobile phone, PDA or laptop. The good news is that if you have Bluetooth hardware in your mobile phone, PDA, GPS or headset, you probably won't need to worry about installing special Bluetooth drivers - the software is built-in and ready for use. 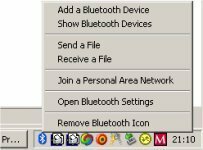 If connecting to a PC, you may need to install Bluetooth drivers, although newer version of Windows XP and Vista come with Bluetooth drivers that can be used with some plug-and-play Bluetooth hardware, so there's less messing around. Where did the term Bluetooth originate? Bluetooth was originally developed by mobile phone company Ericsson in 1994. Looking for a unique name for the technology, they settled on "Bluetooth" after a tenth century viking king called Harald "Bluetooth" Blatand. During his reign, he united Denmark and Norway, and was well known for his ability to help people communicate. Presumably, Ericsson's hope was that Bluetooth technology could do the same. Passcode What is my passcode? In order to 'pair' one Bluetooth device to another, a passcode has to be exchanged between the two devices. When you first connect, one machine will ask you to enter a passcode... enter any 4 digit number. The other device will then ask you for a passcode. Enter the same 4 digit number. It doesn't matter what the passcode is, as long as you enter the same number at both ends. If you have a Bluetooth-enabled mobile phone, then you can use Bluetooth to beam your photos and other objects from your phone to a PC or laptop. You'll need to have Bluetooth on your PC (if it doesn't already have Bluetooth, see our other FAQ on this). With Bluetooth switched on on both the phone and PC, you need to 'pair' the two machines, and then you can use the software on the phone and PC to transfer files. Bluetooth on a PC If you want to add Bluetooth functionality to your PC or laptop, the best bet is to buy yourself a Bluetooth USB adapter that plugs into a spare USB port on your PC. We recommend the Belkin USB Bluetooth adapter available for around £12. This comes with the software needed to get a Windows 98 SE, Me, 2000, XP or Vista PC enabled with Bluetooth. Is Bluetooth the same as wi-fi? Bluetooth is not to be mistaken for Wi-fi (wireless networking) - Bluetooth runs at a lower speed and power than Wi-fi. Are WiFi and Bluetooth compatible? Bluetooth and WiFi are both radio technologies, but they differ in the frequencies and protocols that they use. They don't interfere with each other, but the two don't talk to each other either - in other words you can't get a device with Bluetooth to communicate to a device that only supports WiFi. There seem to be a number of security concerns about Bluetooth - should I be worried? 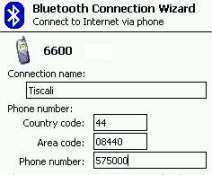 Bluejacking - A craze in 2004, where people with Bluetooth mobiles scan for other users with Bluetooth enabled, and beam a Contact Card containing a greeting. This is usually harmless, and exploits a common feature of Bluetooth - the ability to beam business cards. You still have to accept the card. There's some clever software out there that can make use of vulnerabilities in a small number of Bluetooth phones, to establish a data connection. For most people, the likelihood of something nasty happening is pretty low, but if you want to play it safe, here are a few tips: 1) when not using Bluetooth, turn it off. 2) Set your Bluetooth mode so that it isn't discoverable. 3) Be careful of devices that may have a guessable passcode. 4) Be careful when setting a device to "trusted" or "authorised", as that device can then access all of your devices services, features, and potentially - data. Compatibility Are all Bluetooth devices compatible with each other? Thanks to Frank Kubanek for contributing the following note: Bluetooth is equivalent to a 'wireless USB cable' with the security and limitations. To prevent disappointment and angry buyers, note that Bluetooth is a new technology coming to market, and although the standards are established, implementation depends on the vendor. The hardware will work as advertised, but it's important to note that the drivers for the devices are not necessarily there to allow all Bluetooth devices to connect to all other Bluetooth devices. The standard exists and the hardware exists, hopefully the vendors of Bluetooth devices don't destroy the market by promises of compatibility and a failure to deliver. Got a question on Bluetooth? Please ask in our forum. The FrequencyCast podcast covers UK technology, gadgets and digital TV. Here, we offer some help and advice on connecting mobile phones and PDAs using Bluetooth technology. 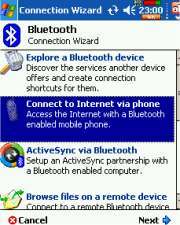 Here are some basic instructions for setting up a Windows Mobile Pocket PC device and a mobile phone for Internet access over Bluetooth. We're using a Windows Mobile iPAQ as an example. We have instructions for the Loox here. Turn on the Bluetooth phone and enable Bluetooth - how you do this depends on the make and model. If in doubt, check your phone's manual. (On an IPAQ, this is Settings > Connections > Bluetooth > Bluetooth Manager), select "New" to start the wizard. Select "Connect to Internet via phone" and press "Next"
You'll be prompted for a Passkey. Enter "1234" and press "Next". Look at the phone - you should be being prompted to enter a passkey - enter "1234" and proceed. The PDA will then discover what services are available. Tick the "use as default connection", and then tap on "New connection". Enter details of the dialup account you want to use (more here). Now, go to the web browser, and try to visit a website - You'll be asked for your dialup username and password. Once you've entered this, the PDA should start dialling, and make the connection. This section helps with using Bluetooth on a Series 60 phone such as a Nokia N95, or the Nokia 6220. From the first tab, select 'Bluetooth', and set Bluetooth to "On"
Move to the second tab, press "Options" and select "New paired device"
You will be prompted to enter the passcode on the device you want to pair to (unless it already has a passcode). Enter the code that matches the one you entered on the phone, and "ok" it. To allow the phone to always connect without prompting and pairing, you can set the device as "Authorised". Do this by selecting the device, and from the Options menu, select "Set as authorised". Go to Control panel, 'Connections' tab, and select 'Bluetooth'. From the 'Settings' tab, set 'Operation mode:' to "Discoverable"